As a follow up to my post yesterday about Seth Godin’s opening keynote at INBOUND, today started off with a bang with an inspirational keynote from Arianna Huffington. Again I will try to pull an opinion at the end as to what the takeaways are from this and how you can apply it to your video marketing. For those of you who may not know, Arianna founded the Huffington Post in 2005 and it has transformed the news media world wide. 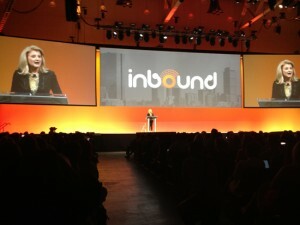 Of all the keynote speakers at INBOUND13 I was most excited to hear Arianna Huffington, and she did not disappoint. Her keynote was focused on leadership and redefining success, however it was more deeply focused on redefining ourselves to achieve those goals. Her delivery was cool, it didn’t feel scripted. It felt organic, like we were having a chat over coffee. Very personal. She spoke to the fact that as a culture, we are afraid of space and silence. That we spend much too much time connected to devices and not enough time connecting with ourselves. Not getting enough sleep. Not having “real” conversations. She spoke of how we are burning the candle at both ends and a “culture of burnout cannot be a culture of sustained creativity.” So we need to recharge. Two other points really hit home for me. One was when she brought up how “The worst things in life opens doors to the best opportunities.” Having had a challenging year, both personally and professionally, I always think this to myself and reassure myself of this. I know some of you are picturing me reciting this in front of the mirror a la Jack Handey. It’s not quite like that, more in my head with those voices Arianna called “the obnoxious roommate in your head.” Definitely no mirror. It was nice to hear one of the most powerful women in the world reaffirm this belief of mine that good times always follow the bad. The final note she ended on was a quote from Archimedes, “Give me a place to stand and I can move the world” to which she added, “That place is within us. Leaders find that place.” So by finding that center within you, that place to clear your head and recharge, is the only way you can truly achieve greatness. The thing I felt was the most applicable point that she discussed was to “lean back before you lean back in”. In other words take a break to recharge so you can truly give whatever your endeavor is 100% of your best effort. In terms of your video marketing, this is after you’ve created content and have launched it all optimized and stuff on your landing pages, social media channels, etc. Pause. Take a breath. Now measure. Measuring the success of your video content is critical because it will tell you what worked, what didn’t and why. If you’re always producing new content and putting it out there, you are missing a crucial step in understanding what resonates with your audience. So remember to analyze all of your video content metrics to better understand and refine your video content going forward. Stand up, stretch, close your eyes and take a breath. It’s OK. Ultimately your content will be better because of it. Great article, Eric! “The worst things in life opens doors to the best opportunities,” is playing out in my life as well and is my mantra for things going forward. I also like the “lean back” theory in trying to regroup and then charge ahead at my very best. I think the world has morphed into a list of impossible tasks that pulls technology to the top and pushes personal interactions to the bottom. Time to upend the list. Well done! Thanks Cindy! She was a wonderful speaker, you would have loved her. At one point her notes kept falling off the podium and any other person like you or I would have probably been flustered but she just said “Who keeps sneaking up on stage and knocking my notes over?” and just kept right on going.